In people's daily lives, numerous consumer products are used inside the home, and the natural and synthetic chemicals in them often end up in the local sewage treatment plant or household septic system. For example, when someone scrubs and disinfects sinks and toilets, chemicals from the cleansers flow down the drain and down the toilet. Similarly, chemicals in toothpaste flow down the sink when someone is brushing. When someone showers after a day at the beach (and hence after a day of applying sunscreen), chemicals in the sunscreen are washed down the drain. When cough medicine is administered to ease cold or flu symptoms, some of the chemicals in the medicine will pass through the body and will be flushed down the toilet. Bacteria in sewage treatment plants and septic systems metabolize some of these consumer chemicals, but a small amount are transported into the aquatic environment . Consumer chemicals used outside the house also end up in the aquatic environment. Lawn-watering can carry fertilizers and weed killers into gutters and storm drains. Storm runoff can carry products used in automobiles (e.g., antifreeze, transmission and brake fluid, gasoline, and motor oil) from streets and driveways into storm drains. Soap and detergent used when a car is washed loosen these pollutants from the car. Trace the path of the soapy water to the storm drains: eventually, the soapy water and pollutants in it will end up in nearby lakes and streams. Exhaust from watercraft such as boats and jet skis can carry chemicals used in gasoline into lakes and reservoirs . Chemicals in gasoline used in snowmobiles can eventually reach mountain streams when the snow melts. Although household chemicals in water are being found in extremely low concentrations, much new research is needed to determine what, if anything, needs to be done to protect human health and the environment from these nonconventional pollutants. Until recently, chemists could not detect consumer chemicals in water samples because the concentrations were so small. But now, consumer chemicals are being found in water samples from all over the world. For example, triclosan, an antiseptic used in acne creams, has been found in surface water and groundwater in the United States. Chemicals used in detergents and household cleansers also have been found in water samples. Limonene, a fragrance that gives a pleasant lemon-like odor to some cleansers, has been found in groundwater. Chemicals called nitromusks are used in most consumer products with fragrance, such as cosmetics, detergents, and toiletries. The metabolites of nitromusks have been found in sewage, river water, numerous animals, and even human breast milk. Breakdown products of nonylphenols , which are used in detergents, are commonly found in sewage effluent (discharge). People worldwide have an affinity for coffee. The caffeine it contains can be used as a tracer in fresh waters (e.g., groundwater), because caffeine otherwise is unlikely to enter waterbodies naturally, unless there is an obvious source nearby, such as a coffee bean plantation or processing plant. was found at high concentrations in Lake Tahoe, California and Nevada, and resulted in watercraft with carbureted two-stroke engines being banned from the lake. Medicines are designed to persist in the body long enough to have the desired therapeutic effect. Because their chemical structures resist extensive degradation by bacteria, trace amounts of many prescription and non-prescription medicines have been found in water samples. For example, carbamazepine, a medicine used for treatment of seizures, has been detected in surface water and groundwater in Europe, Canada, and the United States. Clofibric acid, a metabolite of drugs used to lower blood lipid and cholesterol levels, has been found in rural lakes in Switzerland, the North Sea, and even in household tap water in Germany. The antibiotics erythromycin and chloramphenicol have been found in sewage effluent and surface water in Germany. The synthetic hormone 17α-ethynylestradiol used in birth-control pills has been found in treated sewage effluent from Germany, Canada, the United States, and Brazil. Because the concentrations of consumer chemicals in water supplies are so low, acute toxicity to humans is unlikely from drinking water containing these chemicals. The concentrations of most drugs that have been found in water are much less than 1 part per billion (ppb), or 0.0000001 percent. To cause acute toxicity, a person would have to drink enormous amounts of water because the concentrations of such chemicals in the environment are much less than the therapeutic dose. Even in the highly unlikely event of acute toxicity, such toxicity is easily detected, and measures can be rapidly taken to mitigate problems. 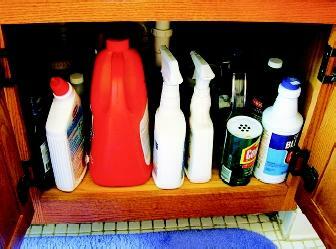 Using common household cleaning products sends chemicals down the drain and ultimately into a receiving waterbody. Scientists are concerned about the unknown impacts of consumer chemicals on the environment and human health. Because a person probably would not consume enormous amounts of water on a regular basis, it would take a period of time for the person to consume the equivalent of even a single therapeutic dose. For example, a person drinking about 3.8 liters (1 gallon) of water a day that contained 1 ppb of a pharmaceutical would consume the equivalent of one tablet of Ritalin® or Valium® in 3.5 years; one capsule of Benadryl® in 14.5 years; or one tablet of Childrens Tylenol® in 58 years. The major concern is that long-term exposure to low concentrations of these chemicals may cause subtle, almost imperceptible, effects that could accumulate over time and ultimately have profound effects on both humans and aquatic organisms. For example, hormones work in the body at very low concentrations and can affect sexual development. Natural and synthetic hormones (such as 17α-ethynylestradiol) as well as chemicals that mimic hormones (such as nonylphenols and phthalates) in sewage effluent therefore could cause subtle effects in aquatic animals. In fact, studies have already revealed effects of low concentrations of hormones. Feminization of wild male fish has been observed in rivers downstream of sewage treatment plants. Male fish exposed to hormones in sewage effluent produce a protein that usually only female fish produce for making eggs. In addition, the testes of male fish may contain ovarian tissue that can even produce eggs. In humans, the chemical serotonin is a neurotransmitter whose metabolism is inhibited by several commonly used antidepressants, including Prozac®. Serotonin is also important in the physiology of invertebrates. In mollusks , serotonin regulates spawning and induction of larval metamorphosis. In crustaceans, such as the lobster, it controls aggression and maturation of the ovaries. Although the active ingredient in Prozac® has not yet been found in natural waters, scientists in the laboratory have found that in low ppb concentrations Prozac stimulates spawning behavior in zebra mussels. Subtle changes in an organism's behavior caused by antidepressants in the environment are types of subtle effects that likely would pass unnoticed. Early research is underway to answer several important questions. Out of the thousands of chemicals used in consumer products, which ones can make it through stormwater and wastewater treatment facilities, and what are their concentrations in the environment? At these concentrations, what effects on humans or aquatic organisms can be expected from any of these chemicals or combinations of them? What can be done to help prevent their transport to aquatic environments, or what modifications can be made to stormwater and wastewater treatment facilities to increase their effectiveness in removing the chemicals? Answers to these questions are needed to determine possible measures to protect human health and the aquatic environment from extremely low concentrations of consumer chemicals in water. SEE ALSO Chemicals from Pharmaceuticals and Personal Care Products ; Ecology, Fresh-Water ; Land Use and Water Quality ; Pollution of Groundwater ; Pollution of Lakes and Streams ; Pollution Sources: Point and Nonpoint ; Safe Drinking Water Act ; Supplies, Public and Domestic Water ; Wastewater Treatment and Management . Daughton, Christian G., and Thomas A. Ternes. "Pharmaceuticals and Personal Care Products in the Environment: Agents of Subtle Change?" Environmental Health Perspectives 107, sup. 6 (1999):907–938. Halling-SØrensen, Bent et al. "Occurrence, Fate and Effects of Pharmaceutical Substances in the Environment: A Review." Chemosphere 36, no. 2 (1998):357–393. Jobling, Susan et al. "Widespread Sexual Disruption in Wild Fish." Environmental Science and Technology 32, no. 17 (1998):2498–2506. Seiler, Ralph L. et al. "Caffeine and Pharmaceuticals as Indicators of Wastewater Contamination in Wells." Ground Water 37, no. 3 (1999):405–410. Emerging Water Quality Issues Investigations. U.S. Geological Survey, Toxic Substances Hydrology Program. <http://toxics.usgs.gov/regional/emc.html> . Caffeine is a stimulant found in high concentrations in coffee, tea, and some soft drinks. A pot of coffee can contain more than a gram of caffeine. Caffeine also is found in sewage because some caffeine passes unmetabolized through the body and because people pour unconsumed beverages down the sink. 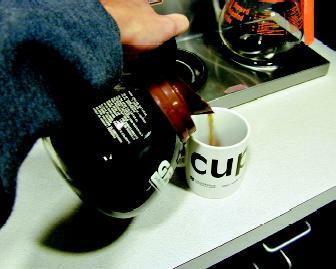 Water contaminated by effluent from sewage treatment plants or septic systems often contains small amounts of caffeine. The presence of caffeine proved that people, and not animals, were the cause of nitrate contamination of well water in a Nevada town, because people intuitively understood that horses and cattle don't drink coffee.